That I was brought up surrounded by apple, apricot, strawberry, myrtille, mirabelle, quetsche–and cherry fruit tarts. Each one of them has a flavor that brings tons of delicious memories about France. And the French countryside where I grew up. I will come back with the recipe. But before then, I am, too, enjoying a slice of the tart with a glass of sparkling rhubarb spritzer. comment faire une tarte sans gluten…? how do you make a gluten free tart…?! ah j’ai les meme fourchettes! hate de voir la recette! Looks absolutely stunning and delicious! This looks delicious. Can’t wait for the recipe! Une très belle tarte et en plus gluten free … hum !! Un joli fond de tarte savoureux et croustillant garni harmonieusement de beaux fruits … J’adore ! Your frequent use of gluten-free recipes puzzles me, since doctors recommend that only people suffering from coeliac disease (gluten intolerance) should follow a gluten-free diet. Do you, Bea, suffering from gluten intolerance? I wonder how many readers do. How about giving alternative ingredients for normal people, who do — after all — make up the majority. Hi Wendy, yes I have a gluten intolerance, hence my recipes use gluten free flours. Of course, these flours can always easily be substituted with others that meet your taste and diet. Gorgeous tart, Bea! Looks deliciously good 🙂 Have a lovely day! J’ai reçu ton livre par la poste hier! Je l’ai déjà survolé, maintenant j’ai hâte de m’y plonger! 🙂 et pourquoi pas faire une tarte aux fruits… mmm… Merci et bonne dégustation! Oh yum! And the spritzer, excellent idea! On attend la recette avec impatience! Looks beautiful Bea! I can’t wait to see your recipe since I suspect my husband has a gluten allergy and I have been trying to cut down on wheat in my kitchen. Also, you will notice on my blog that taking a photo styling workshop with you is on my bucket list. : ) I was sad to miss out on the one at Sunday Suppers, but I can’t make it back to NY until October. I anxiously await another one of your classes! so often I find gf baking a little, well…ugly. Hello Bea, Thank You so much for doing GF recipes there are not to many out there. Your book os really good Me and my son love it, the two of us have Celiac Diseses and it is not fun. I will like to learn how to make the GF country bread that you have in your book. Once’s again thank you so much for a wonderful work on your book and Web. Looks great, can’t wait to see the recipe. Bea, or anyone, what are the delicate baby herb sprigs scattered on the tart?? They look like a great complement to the fruit and custard flavors. Thanks everyone. Recipe will follow…very busy these days around here. Bonjour! 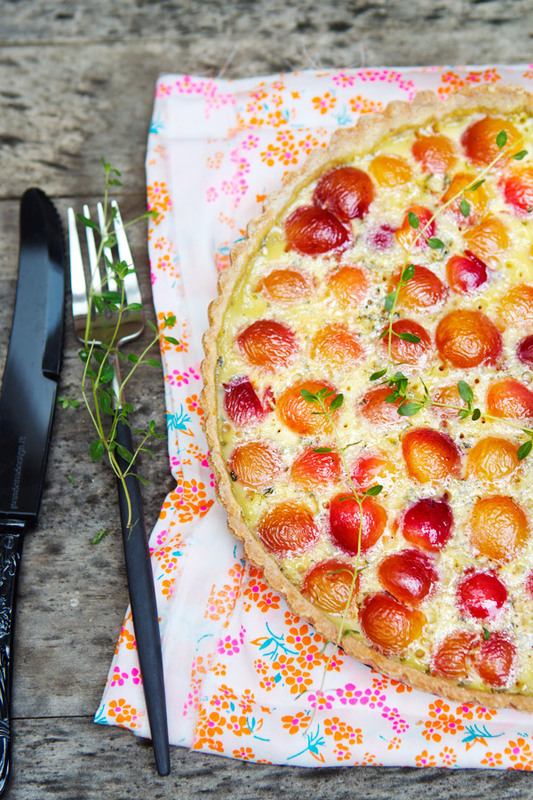 I can’t wait to try making this tart! I am also inclined to gluten intolerance and am so happy to have found your recipes. Also, I bought your book today and it is beautiful and everything in it looks delicious. Thank you! I am wondering too if you know where the lovely colored spoons in your photos come from? I have never seen any like them and they so pretty. Que c’est joli! Est-ce que sont des cerises du fameux cerisier Napoléon (qui fait des fruits orange)? Superbe en tout cas… comme toujours! I’m commenting and you haven’t even given me the recipe yet! Looks amazing. mirabelle! what is that! i don’t even know what that is! not fair! These look just so pretty, delightful. Even blueberry would work. We are just (one hour ago) arribed from one week holiday in Issambres (Cote de azur, Provence)…OMG I want to live there!! And i wanted to do a review of your book in amazon but I didn’t buy it with my account (my husband did) so….as soon as i have a little bit more time i promise i do! “Here for you the sixth issue of Open Kitchen Magazine, our on line food magazine. Don’t forget that you can also become part of our international team in the next issue. That tart looks delicious, I can’t wait for the recipe! Hello! I just recently discovered your blog and I love it. It is a really inspiring daily read. I wanted to upgrade by buying the book, but I have a question triggered by the comments above: are the majority of recipes in your book gluten-free? Hi Zazie, thank you. Yes the recipes are gluten free. They can also easily be use with regular all-purpose flour as well. This looks so delicious! I can’t wait for the recipe! Looks so delicious! Your photos are the best! Where is the recipe?!! I want to make this! Bea, this is the first time I write to you. I work as a chef and I just came back from a trip to Carmel, CA, where I found this cosy bookshop with beautiful cook books, among these I found yours. I was captivated at once! I never read your blog before nor heard about you, but I must say I check your website quite often to keep looking for inspiration. Anyway, the reason Im writing is because I just came back from the market and I bought tons of fresh cherries!! So I was wondering if you could post the recipe for that mouth watering tart. It’s like a frangipane? Thanks and keep on posting nice things! Oh and if you are interested I have a book/place in London to recommend. Its called Ottolenghi, check it out on line and if are in London don’t hesitate in going there. Hello, Bea – I hope all is well with you and your family! I just wanted to thank you for giving so much of yourself to your cookbook. I received it a week ago and absolutely love it. Last night, I made the upside down cake with fresh picked peaches instead of cranberries and was absolutely amazed! Sooo beautiful, sooo yummy! The cranberry, walnut, white chocolate cookies went in to the oven as soon as the cake came out. My very picky eight year old could not stop eating them. 🙂 You have inspired me in many ways through your cookbook, and that is, in my opinion, the best reason for writing. p.s. I wrote a review on amazon for your book, under the name entre nous. oh my gosh that is so amazing! what a gorgeous photo! Thanks so much Kathy for the note and such a kind review of the book on Amazon. I am so touched to know that my recipes inspire you, and they touched your family as well. Thanks Kathy! Very happy! Thanks so much for your note and kind words. I am so delighted to read that you are inspired. I promise to post the recipe soon! Also, I’ve been to Ottolenghi in London–last year in the summer–and loved it. Merci! Thanks so so much Clare for your words and openness. I wish you a prompt healing and send you all my positive thoughts and inspiration for cooking gluten free. Eating and cooking gluten free made me a better and more knowledgeable cook–and for my own reasons, made my feel much better too! Oh yes. Yum. I love the fruit tarts that come with the growing season. And your photos of them! Cette tarte sans gluten à définitivement l’air délicieuce! J’ attendrais pour la recette afin que je puisse essayer moi-même. les tartes aux mirabelles, j’en ai mangé un paquet durant mes vacances à la campagne, il reste les confitures pour l’hiver ..